After some wonderful weeks spent at congresses and on holiday, it’s again time to think about the winter season. August has been quite relaxed even if the mileage increased considerably. When possible, I tried to jump on a bike or start back sailing, in order to cross train a bit. Some days in Italy allowed me to enjoy some beautiful hill and mountain sessions. Just one race during this month: a 5×4.2195 m relay I used to test my 10k race pace. The relay team after the 4. BARMER GEK Halbmarathon-Staffel 2015. 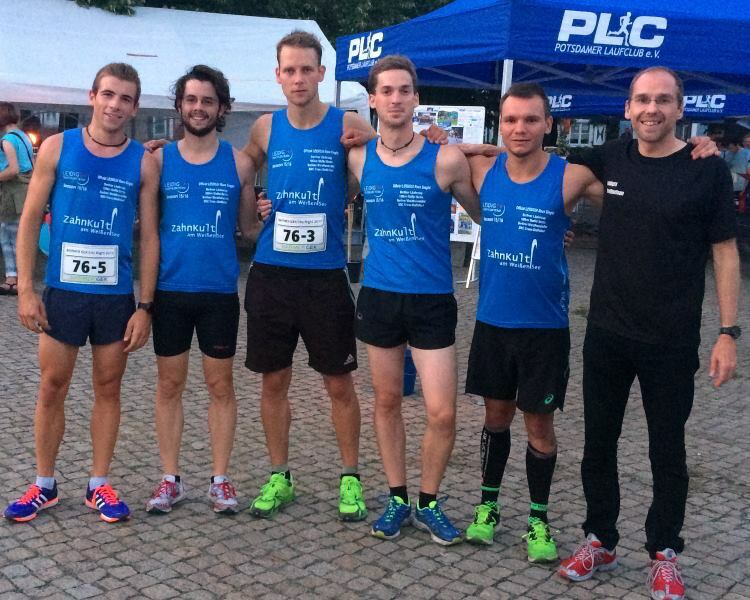 © LEIDIG24 Triathlon Team. Sa 01/08/2015 Easy, hilly, 35′. Su 02/08/2015 65′ technical trail. Mo 03/08/2015 Easy, hilly 25′, slow 15′, running drills, 4 strides on grass. Tu 04/08/2015 Arms and core strength. We 05/08/2015 Easy 20′. Easy, hilly 20′, hurdles and running drills, 2 laps on grass (long side fast, short side slow), 1+2 laps progression on grass, 4 strides on grass. Su 09/08/2015 Easy 50′. 40 km road bike. Tu 11/08/2015 Easy 20′, running drills, 2 strides, 5×200 m (200 m jog rest), CD. Off. Th 13/08/2015 Arms and core strength. Fr 14/08/2015 50′. 30′ jog. Su 16/08/2015 Easy 35′, 2 strides, 1×200 m uphill (200 m jog rest), 3×950 m XC laps (float uphills, easy downhills), CD. Mo 17/08/2015 40′ with some progression. Tu 18/08/2015 Easy 20′, 2 strides on grass, 6×300 m on grass (200 m jog rest), CD. Th 20/08/2015 Easy 15′, float 8′, slow 15′. Sa 22/08/2015 15′, hilly 10′ (float uphills), 10′. Easy 25′. Tu 25/08/2015 Slow 15′, 5×100 m strides on grass (100 m jog rest), slow 15′. We 26/08/2015 RACE: 4.2 km (4. BARMER GEK Halbmarathon-Staffel). Fr 28/08/2015 Easy 45′ with some fartlek (15’+15′ fartlek+15′). Sa 29/08/2015 Arms, legs and core strength. 25′. Su 30/08/2015 140′ sailing (Laser Bahia). 25′.